Last night, right after the rain, a bird with a lot of color parked itself in the dead branches at the top of one of the aspen trees. I couldn't quite tell, in the odd after-rain light, (until looking at the pix on the computer) if it was just a robin, although it didn't act very robin like. 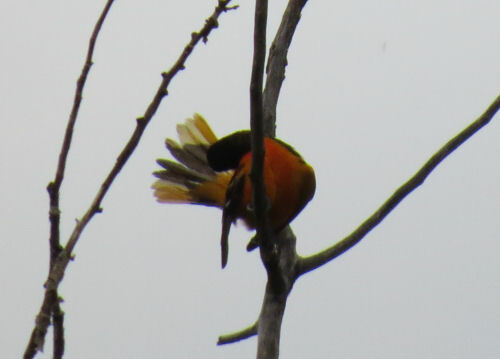 It's an oriole, but it wasn't acting much like an oriole either, I didn't think. They usually hide a lot in the leaves. Sing their heads off, but don't flaunt that color out in the open. However, he perched and preened there for quite a while. When I drove in the driveway this evening, look who was in the same place! He let me get much closer tonight. Never flinched nor fluttered. Very odd. We've never had one stay and build a nest. I wonder if this one is thinking about it. Today was one of my days to volunteer at the Shagway Arts Barn. It's open, but the season hasn't really gotten going here yet, so after helping shift things around to accommodate a wedding that will be there this weekend, I had a lot of free time, which I put to good use. I finished chapter 5 of The Bigg Boss. I also made yogurt- earlier, before going out to Shagway. 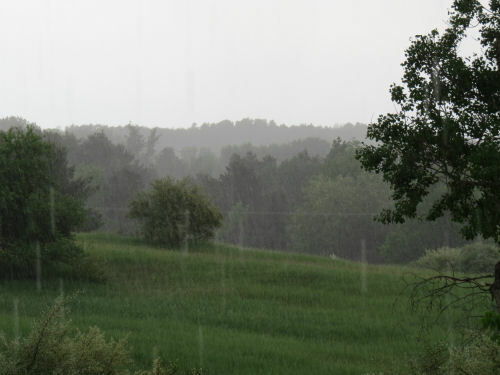 The storm finally got around to arriving, and for a few blessed minutes everything was wet and cool. I went out and sat on the deck. I felt like I could breathe for the first time in three days. It's stopped raining now, but might rain more tomorrow, and then cool down to something much more reasonable. I'm glad. 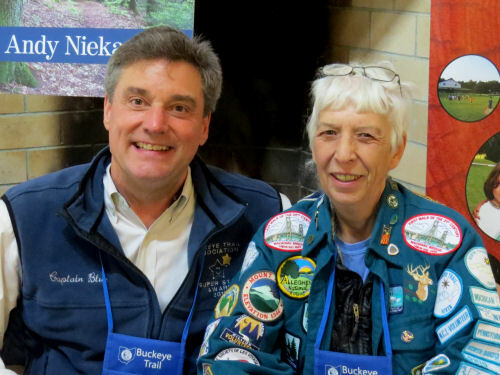 In other news: I spent quite a few hours organizing the paperwork for the North Country Trail Long Distance Hikers awards. Read a book. Napped. I need the temperature to come down a little. 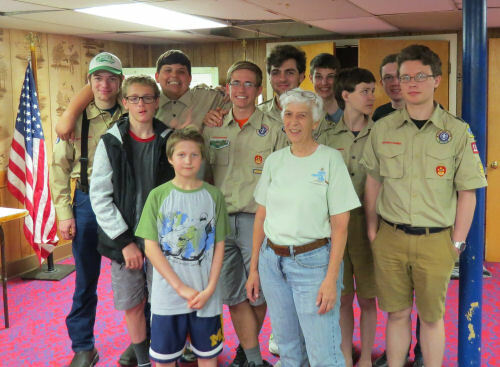 Tonight I gave my talk about backpacking food to the local Boy Scout troop. They seem like a pretty energetic bunch. Three of them have Eagle. That really covers all of what I did today. 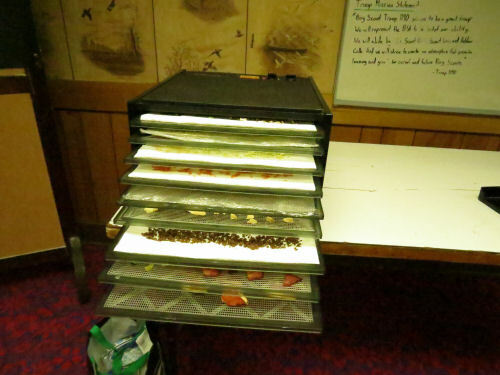 Had to shop for food, fill up the dehydrator, make sure I had enough handouts and stuff like that. I hope the guys didn't mind hearing from an old woman, but they seemed to warm up as we went along. I'm really happy about my bird story for the day, but it's not first in the lineup because the picture that goes with it is crappy. So I'll do the stories chronologically. 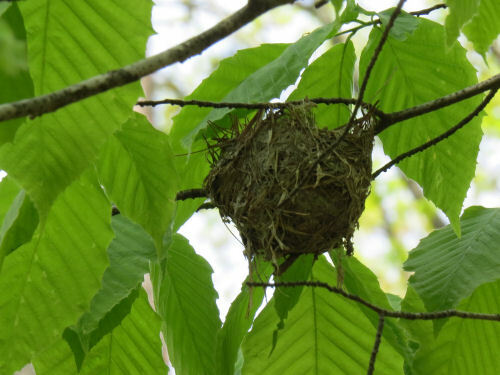 First is a vireo nest. I found it the other day at Magoon Creek. I had encountered one last year and was stumped. 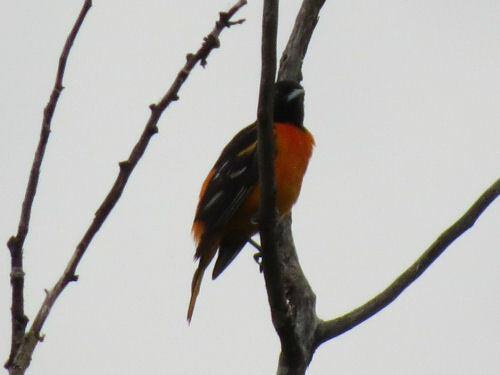 It looks like a tiny oriole nest the way it hangs from a fork in the branches. 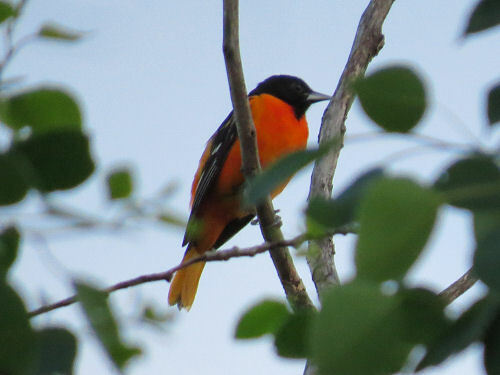 But much too small for an oriole. So I looked it up then, and this time I knew what I was seeing. I don't think it's this year's, because there was no bird hanging around, but I could be wrong. 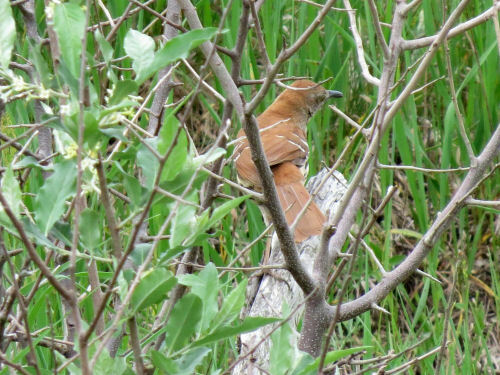 Next is a brown thrasher. There is usually one nesting somewhere near our house, but I think this one might be checking out the forsythia bush right in the front yard. It was there yesterday, and again today, so I ran for the camera. This isn't the forsythia (stupid autumn olive), but it didn't go far away. We'll see if it's back again tomorrow. The baby thrasher that Maggie and I found a few years ago wasn't much farther away, but not right by the driveway. Now for the best! Remember my lament about the bird bath that the birds never use? Well, I like lost causes and improbabilities, so I put it out again this year. I had added a rock in the middle thinking maybe the birds didn't like the smooth ceramic edge to sit on. 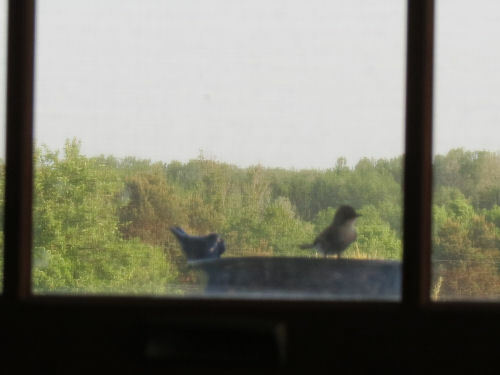 Also, remember the phoebe bookends that would come sit on the two empty bird feeders last year? They came back this spring. Do pheobes mate for life? I have no idea, but I'm guessing at least one of them is the same. So, they've been sitting there, one or two at a time. I suspect the nest is back in the aspen grove. Last night, when it was still so hot, one of them dipped down to the birdbath and sat on the ceramic bird. I guess that means they aren't scared off by those fakes. Then it took a drink! No chance of a picture. Today, one of them has gotten a drink five times that I saw. And I've been sitting around with the camera hoping to catch it. I know it's not much of a shot- through the window and screen, and I only caught it sitting on the edge (not the rock- so I guess they don't care), not actually drinking. But I feel awesome to give the birdies a place to get water on a hot, hot day! I hope others will figure it out. Oddly enough, a few days ago there was a robin on the deck rail, and then a pair of mourning doves. I'd never seen either of those birds on the deck. In other news: I did book sales accounting, wrote half a chapter in The Bigg Boss, and then wrote my monthly newspaper column. Took a short walk early before it got too hot. Might go out again now. It's cooling a bit- below 80 anyway. Reading another book- about as energetic as I feel at 90 degrees. ... and that makes me SO happy. I love blue. It's peaceful. 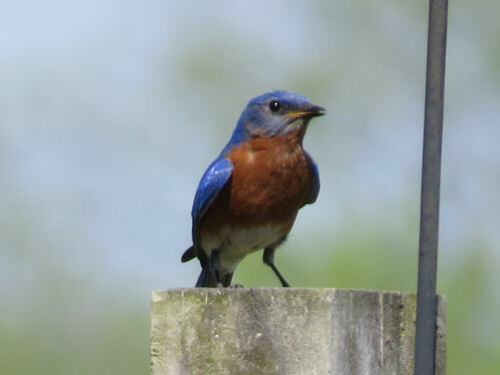 This bluebird snagged some large insect and flew to the top of my clothesline pole with it. He swallowed it before I could get the camera! You'd think he would look happier since he'd just had a nice snack. 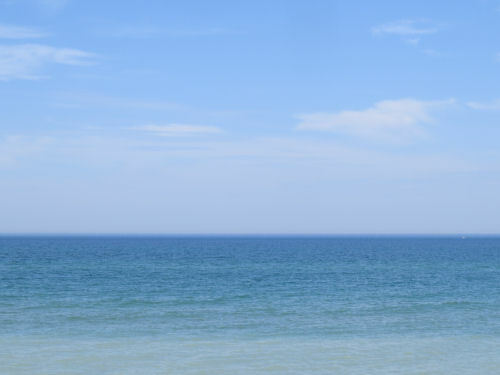 There's just something about the vast expanse of Lake Michigan and sky that never gets old. I love putting something in the foreground of pictures like this to create perspective, but sometimes I just like that "forever" look of nothing but blue. I've officially given up pretending to have a flower garden. I'll enjoy the work of other gardeners and stop being so frustrated by all the hungry critters and the poor soil here. 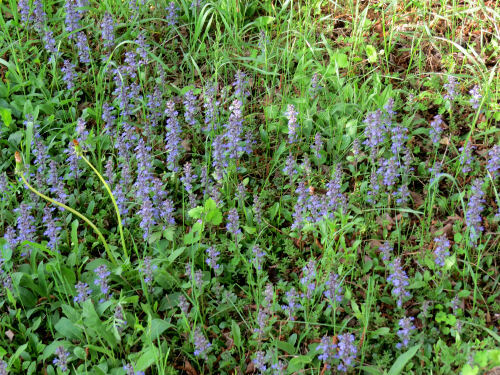 That said, the ajuga still comes up and looks pretty for a few days in the spring. Saving the best for last. 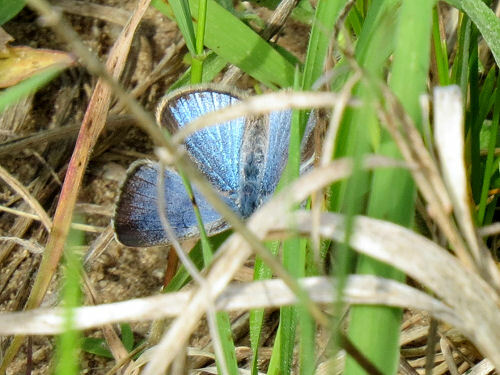 Not that this is a great picture, but it's the best one I've gotten yet of one of the little Spring Azure butterflies. They are all over right now. I probably scare up hundreds when I walk out back. But they are nervous... hardly ever actually lighting on anything, and when then do and fold their wings they disappear since the underwings are dusky brown. This is a female, with the black edges on the wings. The boys don't have the black edges. They are less than an inch across, and it's like walking knee-deep through flying chips of paint. She's got her head downwards. In other news: I wrote, I did a bunch of little computer tasks. In the afternoon I goofed off and read a book. It's hot. Really hot, and I don't get along with hot. 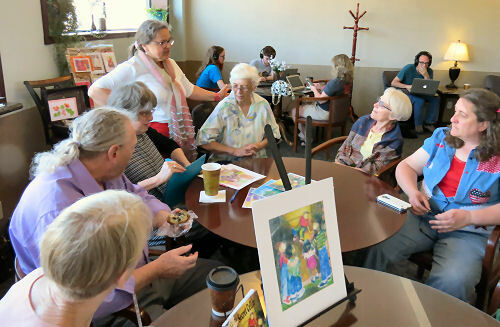 Today was an event at the local bookstore, BookMark, in Ludington. It featured interviews with Linda J. Sandow, my cover artist for the children's mysteries, and me. This was a somewhat low-key event, so I was really happy to have this good a turnout. Hanne Kelly is a great moderator for these. She is good at asking questions and instigating interaction. She is the one standing. You can see cover art from The Secret Cellar on display. Linda is selling a few limited edition prints. Here is some of that interaction between Linda and me. It was actually pretty exciting, because Linda brought the draft of the color cover for The Bigg Boss. I had not seen a completed version of that before. 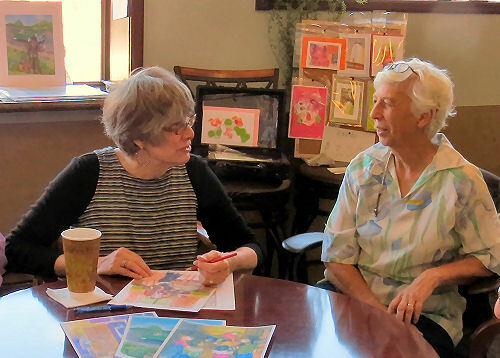 We talked about how our collaboration came about, and how it has grown. We both think it's been a great thing! Linda also shared about the children's book she's been writing. It's based on her known family history in the early 1700's. She says she's just writing it for her grandchildren, but it's really very good, and several of us hope she'll publish it. I sold 11 books today, and BookMark stocked up with some more copies of my titles! Next event I'll be at is June 5, at the Scriptorium book store in Clawson, MI (near Detroit). 7 pm... Come if you live over that way! In other news: Well, not much. I was mostly getting ready for this event or doing it. And it's the hottest day we've had yet. I don't do hot very well. I did locate the shirt I'm wearing. It's cooler than a fitted shirt, and doesn't make me nuts by looking too girly. I have a piece of fabric I love from which I could make another... wonder if I can find the pattern. By July 6th would be good- I have a 2-day event that weekend. Oh yeah. I knew there was something else. Spent time on a support chat to get my FTP server working right again. No clue why it stopped working unexpectedly. I changed nothing. I managed to leverage a task that needed to be done with a series of fun events. The recycling that we can't do close to home needed to be delivered, and that's also where we buy trash bags for pickup. We were completely out of bags. So, I drove up to the landfill and took care of all that. Then I visited four nearby sites that needed updating for GetOffTheCouch.info. Actually, two of them need to be added. First I stopped at Hoags Lake. It's just a pretty little Forest Service spot where one can picnic or fish. All info was still correct. Then I stopped at Canfield Lake. It's not much of a lake and didn't have true public access until a couple of years ago. (Just a local party site). Now the DNR has added some parking and it's "official." There was a guy there playing frisbee with his dog. The dog was named Prince, and he was friendly. 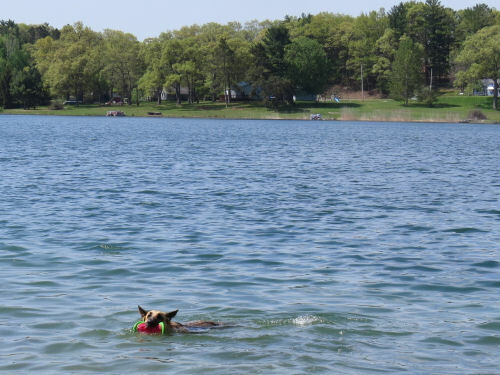 He let me throw his frisbee for him. There's often a swan or two there. Today was no exception. 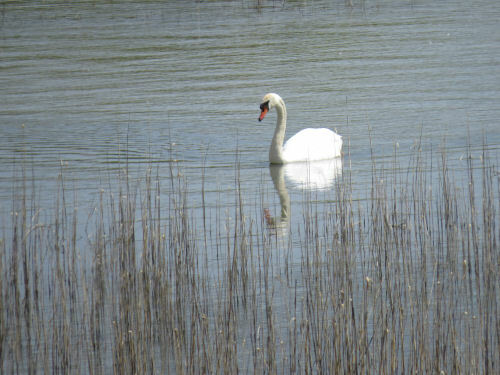 Just a mute swan, but they are always pretty. And I like the horizontal ripples with the vertical reeds. My serious goal of the day was to hike all the trails at Magoon Creek Nature Area and make good notes. It's complex because there is a whole booklet of interpretive info. There are only about 1.5 miles of trail, but I managed to make it 3.5 by the time I walked every part of every loop and got correct info. It's particularly nice because there are several ecosystems even though the area is small, and there are some good hills. 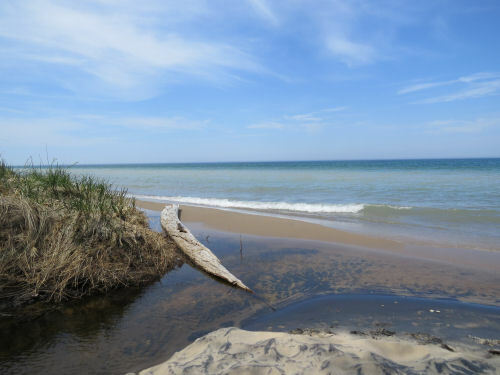 Here's where Magoon Creek empties into Lake Michigan. Just one more quick stop at Sundling Park. 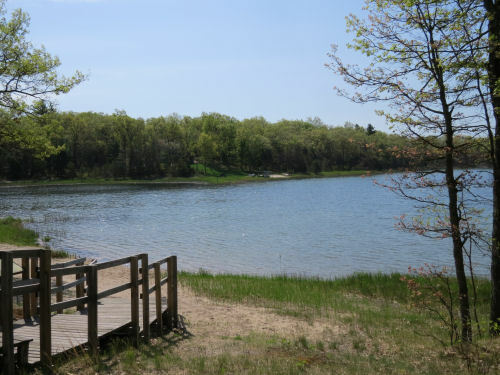 It's pretty much just a narrow access to the Lake Michigan beach, but Filer Township has done a nice job of landscaping that strip so you can enjoy shade and have a cooler place to picnic or rest, as well as climb down to the beach. The lilacs are in full bloom and I think I'm getting high just taking in the scent. I drove home with the window open and it was wonderful! In other news: I tried to get all those pages updated after I got home, but there is something wrong with the FTP. It was working FINE two days ago. I'll have to figure that out. All in all, a mighty fine day. A perfect fit into my master plan for my life. See a very early blog post I Could Do This for a Living. I like to take pictures of me with other hikers. Call it ego. Call it a club. Call it fun. Anyway... here are some. First up is Andy Niekamp, who also wrote a book about his adventure called Captain Blue on the Blue Blazes. I had read and really enjoyed his book, so I was happy to meet him. You've heard about this person before. It's C.W. Spencer. 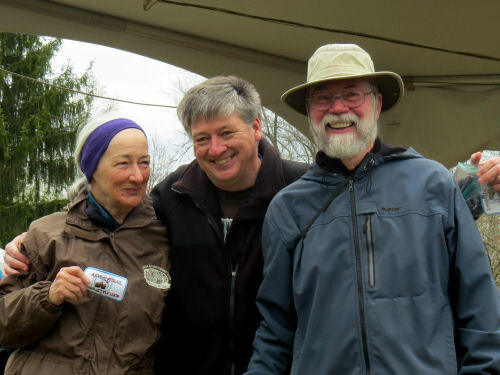 Ester and I stumbled upon him and wife Bonnie hiking in northern Ohio in the fall of 2016. His book about his BT hike is also a book about grief, called Hiking Without Dave. Excellent. 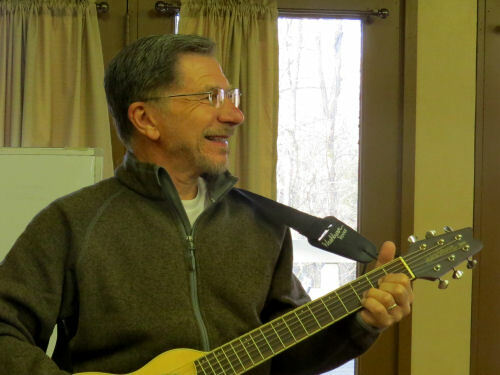 He also led the Sunday morning worship service at the conference. These three people are also circuit hikers. I thought I hadn't met any of them. Wrong! The couple on the left are Chuck and Beth Hewett. 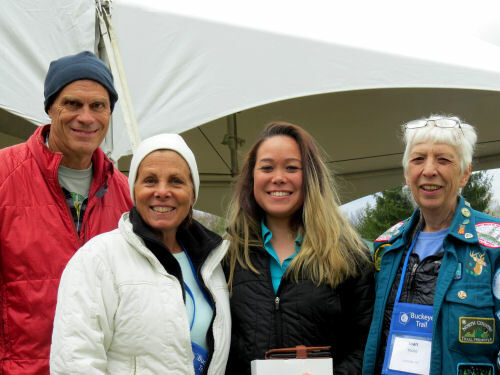 They have written Wandering Ohio, which is a journal style account of their hike. Beth remembered talking with Marie and me in 2014. We had a chance encounter in northern Ohio! But this was definitely the first time I'd met Mei Ling (on the right). She is now off hiking the Appalachian Trail. Long-distance hikers just naturally have things in common. It's a great informal "club" to belong to. In other news: I was good- I stayed home and did stupid odds and ends that needed to be done. 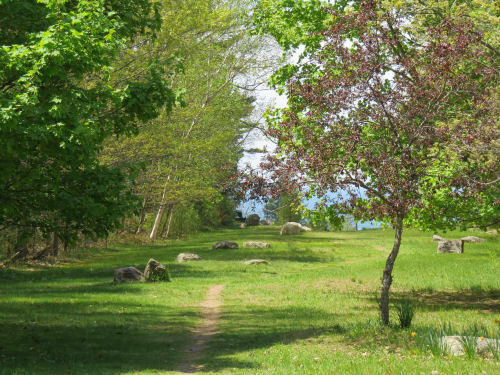 I mowed the rest of the grass and my trails, which I then hiked in the early evening. I wrote a little bit. I got the recycling sorted. I think I may go to bed with a book. This is hands-down the most phenomenal plant sighting of my recent trip to Ohio and Alabama. It took me a long time to figure it out, but I did accomplish the deed. I was waiting to share with you until I had my suspicions confirmed by someone with professional plant knowledge. I sent my question off to a couple of people, and Tony Reznicek (University of Michigan) was the first to respond. He verified that I had correctly identified this flower. First of all, look at this forest opening full of trillium. Do you see anything odd about it? Probably not, it's too long a shot. But the trilliums aren't all the same kind! If you were there you would see how some of them look yellowish or even yellow-green. The large-flowered trilliums fade to pink as they age, so I suspected a different species. As far as I knew there is only one yellow trillium, but I wasn't sure of exactly what key features to look for. I tried to take enough photos to help me later. Got home and looked it up. Definitely not yellow trillium! What the heck is it? So I got out my serious guide to plant identification, Britton and Brown Illustrated Guide to Plants of the Northern States and Canada in three volumes. 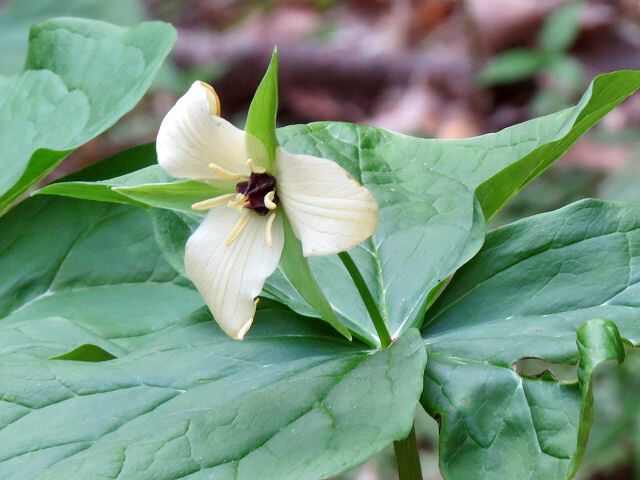 When I was still at Cantwell Cliffs where we found these, this was the biggest thing that convinced me it was not the large-flowered trillium. See how the flower on the left is much shallower, and snuggles into the sepals instead of having a deep cup of petals like the one on the right? Then there are the business parts of the flower. 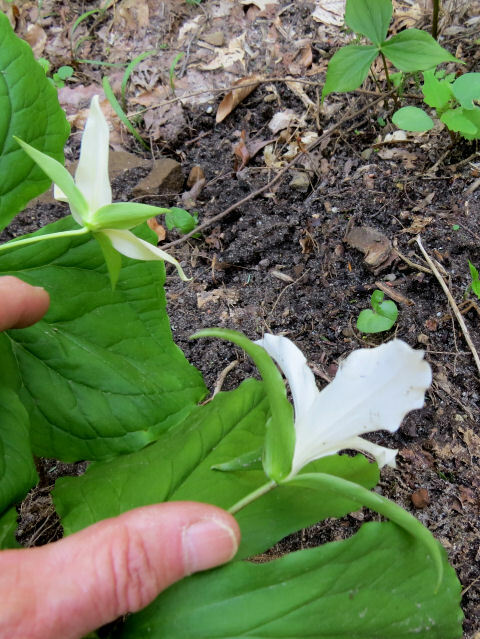 Here is large-flowered on the left and the mystery trillium on the right. See how the stamens are different? See how the ovary of the one on the right is sitting right out in plain view? And it's pink. Sometimes that ovary is deep maroon. That was the aha moment. 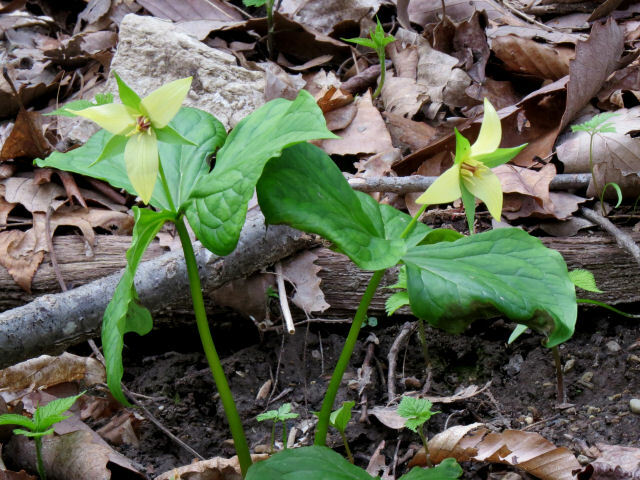 And Britton and Brown said that red trillium can occasionally be found with yellow, green or white petals. And there you have it. 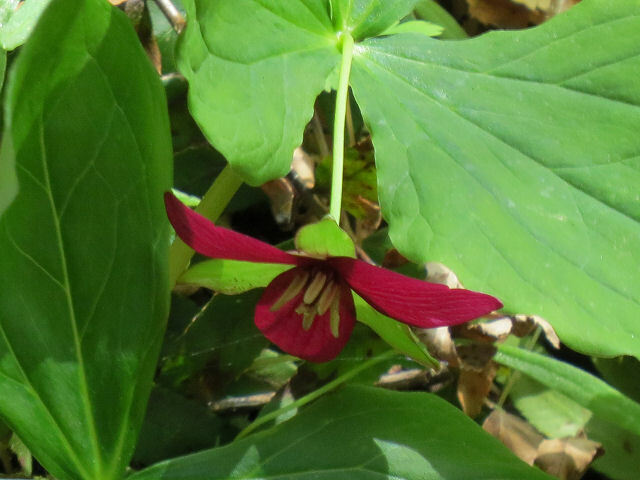 This is a red trillium! How awesome is that? That's one problem with flowers named for their usual color. 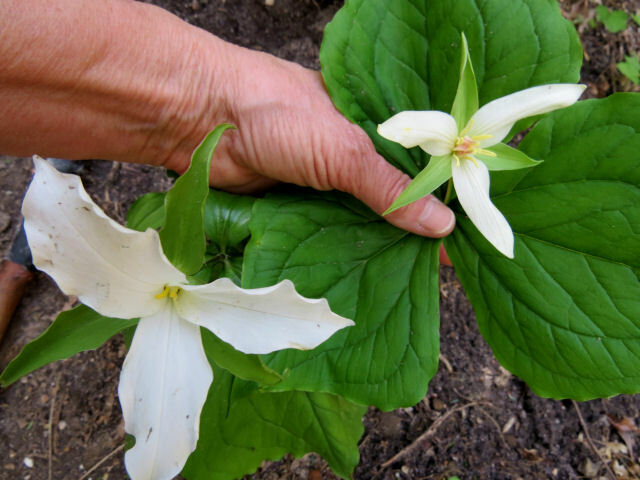 Anyway, this is Trillium erectum, as in erect... the flowers are above the leaves and not curved downward below the leaves. 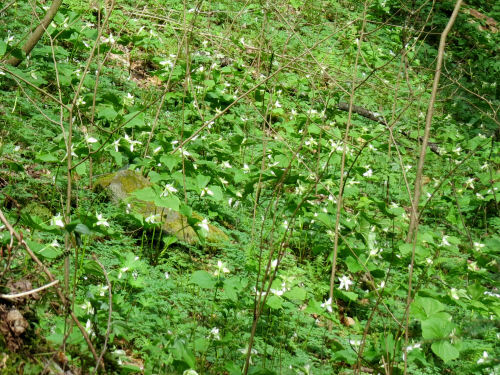 In that same patch there were a few red trilliums that actually were red! Color variants occur more often than you might think. I also have a picture (a very poor one) of a white pink lady slipper orchid that I saw a number of years ago. In other news: It was a very productive day although no actual writing occurred. I spent the morning getting yet more typos fixed in the first three Dubois Files books and uploaded to all the different platforms. Hopefully that will be the last of those edits- good grief! Then I mowed lawn and dug up some autumn olive. Went to the bank and to get mower gas. Took a 5-mile walk. The weather was absolutely gorgeous. Tomorrow is supposed to be more of the same. Maybe I'll be able to justify driving a bit to hike an actual trail. Maybe I'll just finish the mowing. Stay tuned. 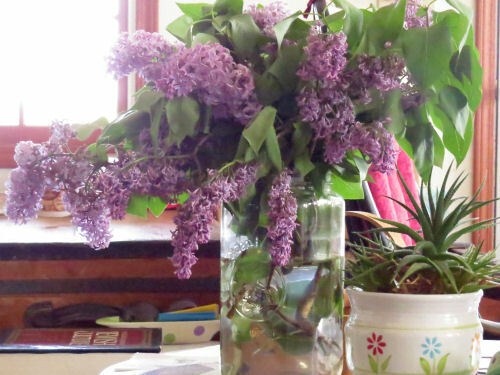 And I'm sitting here breathing in the scent and sight of a jar full of lilac. Wonderful day!